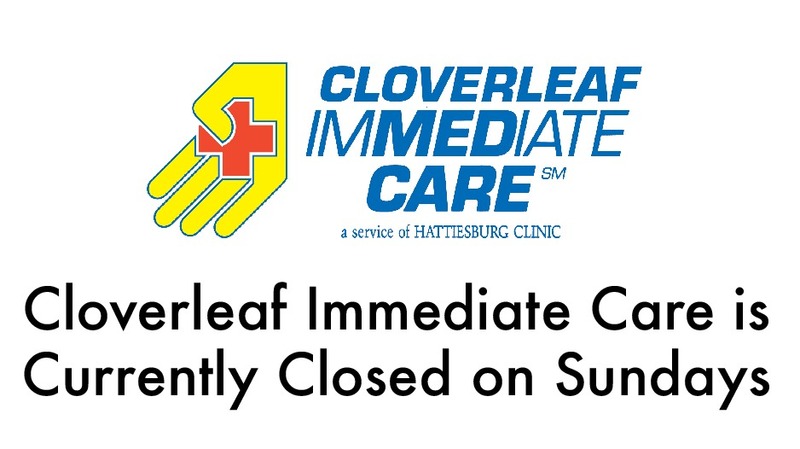 Hattiesburg Clinic Cloverleaf Immediate Care is now closed on Sundays. Other Hattiesburg Clinic locations in the Forrest and Lamar County areas that offer immediate care services on Sundays include Immediate Care, 105 Thornhill Dr., in Hattiesburg, and Immediate Care – Petal, 50 Parkway Lane, in Petal. Cloverleaf Immediate Care offers services for patients who suffer from acute illnesses and/or minor emergencies that need immediate attention. Physicians serving this location are Kenneth L. Gooch, MD, MRO, and John J. Johnson, MD, PhD, MRO. The department’s usual hours are Monday through Friday, 8 a.m. to 6 p.m., and Saturday, 8 a.m. to 4 p.m. They are located at 5909 US Highway 49, Cloverleaf Medical Plaza, Ste. 20, Hattiesburg, Miss. For more information about their services, call (601) 296-2800.